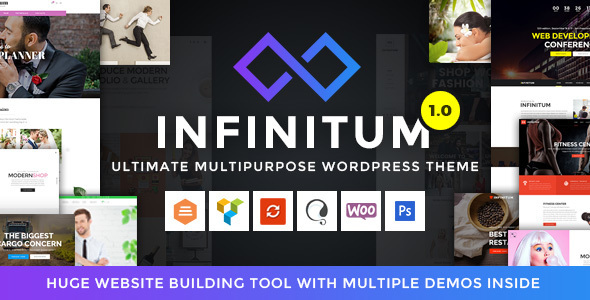 Infinitum is an an amazingly feature-rich and resourceful, creative and colorful, dynamic and modern, highly responsive multipurpose WordPress theme with unlimited features and customisation options inside. Infinitum provides a powerful website building tool where you can bring to life any website dream with modern and attractive look. Intuitive options admin panel and drag & drop page builder will help you to create any type of website you might have planned. We created tons of ready to use demos to showcase theme design in different ways and situations. Pre-built demo data will help you to build your own unique design with one click demo importer. Theme comes with multiple blog, portfolio, gallery and shop layouts. Infinitum is also a great choice for the cases when you want to start selling products or services. It was designed to work perfectly with ecommerce plugins, such as WooCommerce. You can build mind blowing websites with Infinitum in minutes.